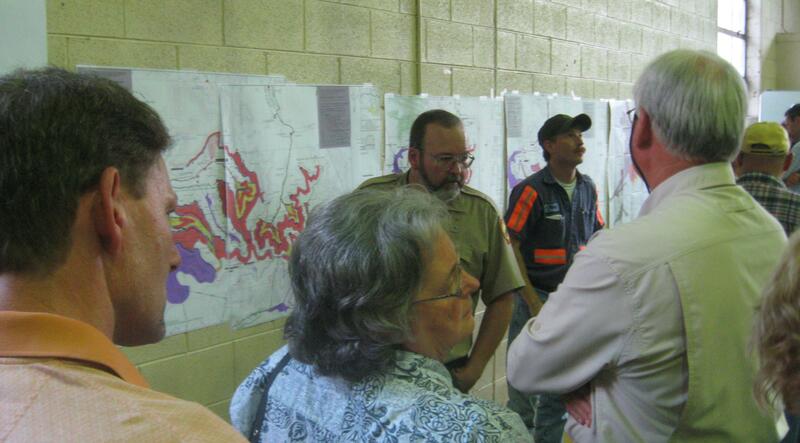 Bee Tree public hearing: Does WVDEP listen to coalfield citizens about mountaintop removal mining? 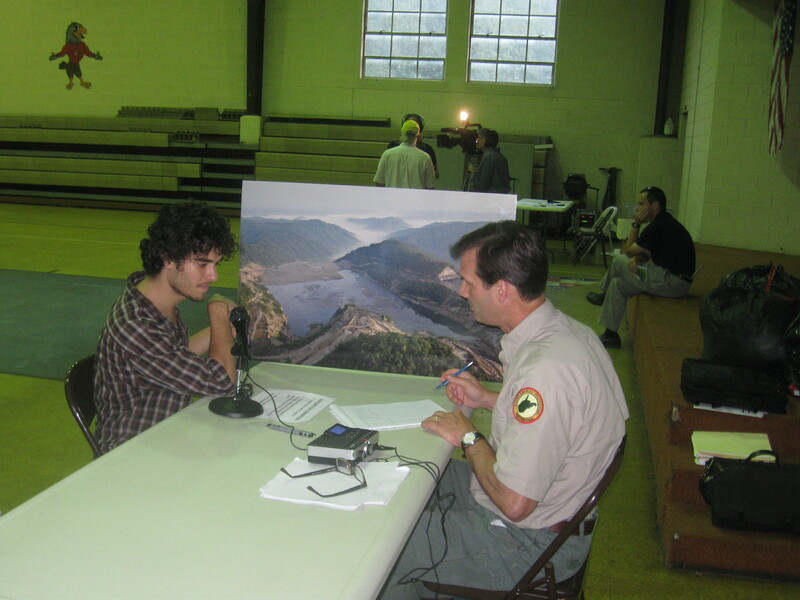 August 12, 2011 by Ken Ward Jr.
W.Va. Department of Environmental Protection official Greg Demyan talks to citizens during a public hearing earlier this week. Gazette Photo by Ken Ward Jr.
PETTUS, W.Va. — Darrell O’Brien of the West Virginia Department of Environmental Protection was pointing to the large mining maps taped to the wall of the gymnasium at the old Pettus School. Citizens were asking questions about the Bee Tree Surface Mine, and especially about the adjacent Brushy Fork coal slurry impoundment. Dianne Bady with the Ohio Valley Environmental Coalition was asking O’Brien about whether the pillars holding up the roof in underground mines beneath the impoundment basin were strong enough — or whether they might crumble and damage the basin. “You need to get your facts right,” O’Brien told Bady, shaking his head at her. I was kind of surprised by O’Brien’s response, so I asked him: Are the pillars strong enough? What’s been done to test them? How are they being monitored? Turns out that O’Brien, who works in WVDEP’s Office of Explosives and Blasting, was the one who didn’t have his facts right. He didn’t know the answers to my questions, even though he’d just chastised a citizen and environmental activist for asking those same questions. O’Brien went and got another WVDEP representative, permitting engineer Greg Demyan, and asked him to explain. Demyan told us about a study that looked at the pillar strength in those underground workings, and determined that even if they all failed, it “wouldn’t affect the impoundment” one little bit. Demyan told us the study was done by a well-respected Ph.D. engineering professor. But, he noted almost in passing, that engineer was hired by Massey Energy, the company that used to own Brushy Fork. WVDEP hasn’t performed its own study of the pillars, their strength, or what might happen if they collapsed. O’Brien had told us that the pillars were checked regularly, but it turns out that isn’t the case. Once the underground works were abandoned, that sort of monitoring ceased. There are some monitors that check potential changes in the impoundment elevation — which might indicate some movement of the pillars — but WVDEP doesn’t check those, instead relying on the company to do so. WVDEP doesn’t even spot-check the company’s monitoring every once in a while to ensure it’s being done properly — even though there’s plenty of recent evidence that the folks operating this facility aren’t above faking safety examinations. This exchange, which took place Tuesday night in Raleigh County, was a fascinating glimpse of how coal-mining operations in West Virginia are regulated — and especially of how WVDEP interacts these days with residents who are concerned about mining’s impact on their communities. Public hearings are a challenge, especially on issues that appear as divisive as mountaintop removal and when both sides are often gearing up to use the hearing more to get their message out to a larger media audience and less to actually provide meaningful input on the permit decision at hand. And it’s especially tricky for an agency like WVDEP, when one side of the issue has tended to send out hundreds of its employees to intimidate the other side and that other side thinks the First Amendment gives them the right to yell, curse and generally be rude. WVDEP tried to avoid that kind of a situation by holding this public hearing — they actually call them “informal conferences” — with a little different format. Inside the gym, they had two different “stations.” At one end of the room, residents could chat with WVDEP officials, and review maps and permit documents. At the other, they could sit at a table and give format comments to an agency staffer who recorded those comments. I’m sure that WVDEP thought this particular informal conference would be a circus. Commentator Jeff Biggers, the online voice of the anti-mountaintop removal movement as a “Coal River Mountain Showdown.” And the Bee Tree Mine continues to be the focus of protests such as the ongoing tree-sit by one young activist. It turned out to be a pretty low-key and well-run affair, though. There wasn’t an angry band of coal miners, and the Alpha/Massey officials I saw kept to themselves and left early. One of the things about hearings is that you hear everybody’s comments — you hear those objecting and you hear from the company — pro and con. It’s important for everyone to hear what everyone else has to say. One person’s comment might answer another person’s questions or concerns. It’s totally unsatisfactory. They want to get away from the heated things that go on for hours and hours. It’s an overreaction to somethings that very well might be out of hand. The true “public hearing” is an important part of our system of government, and a key to developing and maintaining a system of community, where neighbors listen to neighbors. From WVDEP’s perspective, though, the point of these events is to get very specific comments about technical parts of the permit. But residents who attended this week’s event in Pettus were left wondering if WVDEP was really listening to them about those things, whether agency officials wanted to learn what citizens were concerned about — or just defend the agency’s permitting decisions with what sounded like industry talking points. Google it! from jordan freeman on Vimeo. The major concern of this report is the potential for blast-induced residual pore-water pressure increases that reduce the shear strength of a soil long enough to allow gravity to cause the failure of the slopes of earth structures. This paper covers the successful application of explosive compaction technology for the densification of the foundation soils for the seismic upgrade of the Seymour Falls Dam, Vancouver, BC. The point of the additional links is show that explosive compaction of soils and the use of explosives around dams and in and around other granular deposits has been researched and practiced in many parts of the world for many years. Please be assured that the blasting activities around Brushy Fork are not taken lightly by the DEP. Of course, as we’ve reported, WVDEP did not initially set any limits on the impacts of blasting at the Bee Tree Mine on Brushy Fork, and did so only under pressure from a citizen complaint and possible federal OSMRE enforcement action. Citizens at this week’s hearing also quizzed WVDEP about whether Appalachian hardwood forests will be able to regenerate a the Bee Tree Mine Site. WVDEP officials assured them that research shows current reforestation plans are working, despite the fact that research supported by the agency says that’s far from clear. And citizens were also treated to WVDEP’s view that the science doesn’t support EPA’s water quality guidance aimed at reducing the impacts of conductivity pollution on aquatic life in the coalfields — but the agency officials I heard talking about this said they had not reviewed the EPA Science Advisory Board report that confirmed the federal agency’s research. Now, WVDEP staffers have an incredibly tough job. They work hard, put in long hours, and aren’t compensated nearly as well as the industry folks they regulate. While citizen complaints about the agency get most of the media attention, WVDEP insiders will tell you they also put up with a lot from the other side. And in their defense, at least WVDEP had folks there to try to answer questions — rather than sitting silent during a long and heated public hearing like a particular federal agency I could mention, whose initials are EPA. Still, these sorts of interactions with WVDEP do little but confirm the feeling among coalfield residents that agency officials don’t care what they say, and will ignore input if that input goes against what the industry wants. In their defense, WVDEP officials probably believe most of the residents who turn out for such a hearing are adamant opponents of mountaintop removal, and are more interested in trying to get permits stopped than offering comments that would improve a final, issued product. It’s hard to argue that WVDEP is wrong about that. It’s the responsibility of the agency to go out of its way to listen to and hear the concerns the people have even if they are expressed through anger. I continue to think and hope that if there is some kind of mutual respect — even a glimmer of it — that both sides will be able to hear what the other side is saying. It’s the agency’s responsibility to do that, and answer the questions — and if they can’t do that, they should not be issuing these permits. During the hearing in Pettus, I kept thinking about those recordings WVDEP was making of the citizen comments. Who was going to listen to them? Would anybody respond? WVDEP officials told me that permit reviewers would listen to the recordings, and pass on comments to various specialists — engineers, hydrologists, etc. — who would decide if permit changes should be made. But it would certainly be interesting if the DEP mining office began preparing much more detailed “response to comments” documents like those the Division of Air Quality puts together when it makes permitting decisions. Maybe Tom Clarke, the director of the WVDEP Division of Mining and Reclamation, will even take time out to listen to the hearing comments. Maybe he’ll get DEP Secretary Randy Huffman to join him. Heck, maybe Randy will take the records to his next meeting with Senate President Earl Ray Tomblin and Tomblin, acting as governor, will give them a listen too. It’s really depressing that absolutely none of this is remotely surprising. I think it’s important that we continue to attend these “hearings” and voice our concerns, but does anyone really think that the WVDEP really cares what citizens who aren’t with the coal industry have to say? Cindy Rank says… “It’s the responsibility of the agency to go out of its way to listen to and hear the concerns the people have even if they are expressed through anger”. Ken as you are so eager to point out to commentors who support coal, can someone show me where in the state regulations and provide a link that mandates this is DEP’s responsibility? Good question. Thanks for asking for that … I don’t speak for Cindy, and perhaps if she’s reading she will elaborate herself. There’s a more detailed description of citizen rights listed here, http://sites.google.com/site/stripmininghandbook/chapter-4-citizen-rights-and-agency-proceedings-under-smcra that includes references to rules and regluations. Though, without doing any research at all, I would feel comfortable saying there is not a rule that specifically says precisely what Cindy said. The WVDEP man stated that the energy from blasting caused changes in the structure of the sub-surface geology near the dam. I have had a concern for some time now that that same energy can migrate, who knows how far, and damage the rock strata in and near deep mines near active MTR sites. It seems this could result in at a minimum methane leak into those mines and possibly weakening of ceilings resulting catastrophic “accidents”. I’m curious if anyone knows of published data that would answer this question. If it were shown that surface blasting could result in such problems, do I need to question which type of mining would be called to a halt? Surface or deep? I think the answer is obvious. Re the blasting to increase compaction. Anecdotal evidence by anyone who has worked in a garden shows that shaking the soil facillitates small particles filling in around larger ones. Scientific studies have observed the phenomenon of shaking a a bowl of nuts or marbles and watching large particles in migrating to the surface as a result of the small ones filling in smaller spaces. But on a beach when you pump your feet in wet sand, the water begins to liquefy the sand and you begin to sink. The same process is observed in earthquakr areas- geologists call it liquefaction- and formerly stable ground gives way and buildings and roads are destroyed. Maybe blasting in dry conditions would con solidate soils but blasting in the presence of impounded water seems like courting disaster. I am glad Jordan Freeman and you were there to capture these exchanges. It is incredibly problematic when impacted citizens question the competence and commitment of the WVDEP to properly review and issue permits. I don’t see anything in that video, nor in your report, that would inspire anyone who sees it to have confidence in the WVDEP. It is frightening to think what can happen if the WVDEP offical on this video is indeed wrong and his ignorance results in the loss of human life, We know what happened when a dam broke in Martin County, KY. It was 30x larger than the Exxon Valdez environmental disaster, WVDEP officials are ignoring science. Does anyone listen to these citizen’s concerns about their health and saftey? Certainly not at this WVDEP hearing. Have Sen Rockefeller and Sen Manchin even commented on the WVU health studies presented by Dr Hendryx? What if it is true, as indicated in these studies, that MTR is adversely affecting the health of people who live around it? What possible reason could there be for not investigating, nor even commenting about, the findings in those peer reviewed WVU studies? What possible reason could there be for allowing this WVDEP official to retain resonsibility over permits after his comments at the hearing? People deserve to know the truth about how MTR is affecting their health and safety. Isn’t anyone listening to the very real concerns of these WV citizens?